The inside story of the people who stopped a terrifying day from getting worse. One year after the terrorist attack in San Bernardino, California, the ABC News Investigative Unit and “Nightline” are looking back, revealing never-before-seen photos and videos and hearing from the first responders, the victims and the everyday people who prevented a terrifying day from getting any worse. On a sunny December morning as the temperature pushed to 75 degrees, Lt. Mike Madden was sitting in an unmarked police car in a Target parking lot taking a phone call. As he sat there chatting, a flurry of radio traffic was building and sounding increasingly urgent. Clicking off the phone call, Madden roared his car’s engine to life. “Lincoln Three. I will be going 97 on the south side. I need three more units, 97 on my location,” he replied, using his call sign. Callouts about shootings are not uncommon in the area, but this was different. The day was Dec. 2. The city was San Bernardino, California. Two miles away, dispatchers were fielding frantic 911 calls. “They opened the door and just started shooting inside the room,” said a female caller, in recordings obtained by ABC News. Madden, an administrative officer who says that he had never in his 25-year career responded to an active shooter, was racing to the scene. Pulling up, Madden saw people fleeing the complex, known as the Inland Regional Center. He jumped out of his car and took position behind the trunk to shield himself from possible incoming fire while he radioed dispatch. “Go ahead,” said the dispatcher. “Now we have two suspects all dressed in black on the inside of the business on the south side is what we’re being told,” Madden reported. “Copy on that. South side of the business, on the interior … Lincoln Three, do you have anybody with you?” was the response from headquarters. Meanwhile, 911 calls said the shooters were using heavy weapons, possibly AR-15s. Within two minutes, Madden and three other officers were preparing to make entry. Madden was equipped with only a handgun and had left his bulletproof vest in the car. “I don’t have a hero or a God-like complex, but we are the police. Our job is to go in and handle situations,” he later said. Pushing closer to the building, Madden noticed a man sitting on a bench holding a cellphone. But as he and the others pushed closer, Madden said his initial assessment was wrong. The entry team then made its way to the double glass doors on the south side of the complex, which had been shot out by the suspects. Armed with a shotgun, Sandoval took point while the other officers opened the doorway. With fire alarms going off, strobe lights flashing and water sprinklers spraying the room, the officers said that they could smell gunpowder. More than 50 people were dead, injured or sheltering in the conference room. The group had been taking part in a mandatory training session with a planned holiday-themed office party to follow. The gunfire had apparently hit the building’s sprinkler line, causing the entire the system to go off, adding to the chaos. “There was a Christmas tree directly across the room from where I entered and there were people there at the Christmas tree that were down,” Sandoval recalled. As the first cops on scene rushed in, they heard victims begging for help. But, training dictates that they needed to push past the injured and hunt the shooters. Sandoval continued pushing deeper into the building, trying to find the shooters. Quickly, a second wave of first responders was arriving on the scene, including Nathan Scarano, a county probation officer. Looking down, Scarano recalled, he noticed a young woman who was severely wounded. That woman was Amanda Gaspard, then 31. She had been hit twice in the leg. Watch: The Heroes of San Bernardino. “I looked at her, I looked up at the conference room, I looked down at her and I said, ‘You’re not going to die today,’” Scarano said. As those first on the scene pushed through the building in pursuit of the shooters, Scarano and cops in the second wave began removing victims, placing them in probation vehicles and sending them off to the hospital. They were unaware that three pipe bombs had been planted with the intent to kill or maim first responders and surviving victims. They also didn’t know the perpetrators were now on the run. As the rescue operation began in earnest, officers were questioning victims about what they may know. “We had one person who was in the room who was actually a county employee that had recognized that our suspect had left this training holiday get together for country employees,” recalled San Bernardino Police Department Chief Jarrod Burguan. Farook had left minutes before the rampage appearing irritated, after spending time that morning with his coworkers – including his partner, Amanda Gaspard. 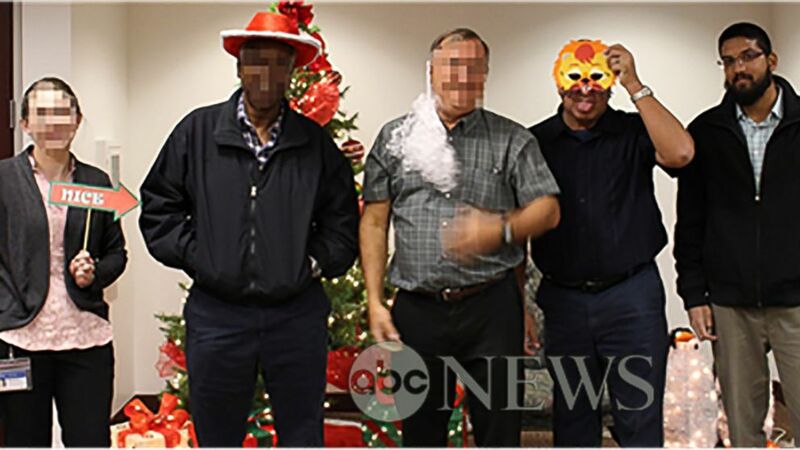 (Obtained by ABC News) In a photo obtained by ABC News, Syed Farook is seen posing with his coworkers in front of a Christmas tree inside the Inland Regional Center shortly before launching into a rampage that left 14 people dead on December 2, 2015. Back at the police station, veteran analyst Daani-Ruth Svonkin began searching databases for any information on Farook. Initially, the databases returned a confusing array of addresses. Svonkin dispatched officers to each location. As fears mounted that the perpetrators might preparing to mount another attack, 911 dispatchers received a call that would be the turning point. Computer programmer Stewart Boden had been on his way home when a black SUV made an abrupt lane change in front of him. “There was such a sudden abrupt move that I was thinking, ‘hmm this is a little unusual for a vehicle coming from Utah,’” he told ABC News. “I think I need to commit that license plate to memory,” he thought. Upon arriving home, Boden flicked on his television where news programs were reporting that police were searching for a black SUV. Previously unaware that a search was on for the vehicle, he immediately dialed 911. “About 20, 25 minutes ago, and I didn’t know anything about any SUV at that time,” he is heard in 911 recordings obtained by ABC News. “And it was a black SUV?” the dispatcher is heard saying. Little did he know, Boden had just provided the crucial evidence that would crack the case. Back at police headquarters, Svonkin took the new data and set to work. Running it through a database, she realized it was a rental car from Enterprise. She immediately phoned a contact she had developed at the company’s corporate headquarters, who said he would skip the standard procedures and get her as much information as he could. The call “seriously cut through some red tape,” she said. The normal process would have taken more time than they had. When the contact phoned back, he had a name: Syed Farook. The new information allowed her to use a different database which provided her with a “singularly different and unique address that I did not locate anywhere else,” she said. She also began the process of pinging Farook’s cellphone – available from his employment contract – in an attempt to locate his last known location. With the new information in hand, she dispatched undercover officers. Within 35 seconds of arriving at the scene, Svonkin said, a black SUV pulled in front of one of the officers. Could those be the shooters they were hunting? “Had we been several seconds later, we probably would have missed him,” said Sgt. Gary Shuelke, who lead the team of undercover officers in unmarked cars. Falling into formation, Undercover Officer Nick Koahou tailed Shuelke’s vehicle in an unmarked van. After a few moments the officers realized they appeared to be heading to the Inland Regional Center – the site of the shooting. Officials now believe the pair wanted to get close enough to remotely detonate the pipe bombs they had left behind. Before they could get there, two marked squad cars pulled into the convoy, and began “rolling code” – or chasing with lights and sirens. Previously on non-scannable frequencies, the officers went live on the regular police radio channels. At the command post, Burguan was sitting at a table with San Bernardino County Sheriff John McMahon and David Bowdich, then the FBI’s top agent in southern California. The trio had been dividing up the workload for the investigation when the radio traffic roared to life. “It looks like they’re putting vests on inside,” radioed Sgt. Andy Capps, of the Redlands Police Department, who was just behind the black SUV. “Copy, copy, passing things around inside the vehicle,” replied the dispatcher, in the 911 calls ABC News obtained. Then the gunfire rang out. “Sitting in that command post and listening to that, and the hearing – knowing that you’ve got your guys that are engaged in a gunbattle like that – I will tell you – it’s heart wrenching,” Burguan recalled. Those bullets were directed at Shaun Wallen, a deputy with the San Bernardino County Sheriff’s Department, whose patrol car was a mere 25 yards behind the black SUV. Steering with his knee, accelerating with his right foot, talking on his radio with his left hand and pulling his rifle out with his right, Wallen was preparing to fight back. The black SUV then slammed on the brakes. Wallen then exited his vehicle, rifle in hand, and began returning fire over his car. Farook had opened the left, rear door of the SUV, from where Malik was also firing at Wallen. To take some of the heat off of Wallen, Sgt. Capps and another officer began engaging Malik, leaving Wallen and Farook in a one-on-one shootout. Koahu, the undercover officer, saw Wallen pinned down, but couldn’t get a clear shot without risking hitting Wallen. After a short period, Farook dashed away from the car toward a residential area. “The prevailing theory is either he was trying to get on the houses, or he was trying to flank me,” Wallen told ABC News. Regardless, it provided Koahu with the opportunity he needed. But with one suspect down, the officers were still under fire from Malik. Wallen radioed his dispatcher to report that Farook was down, but that they were still taking fire from his wife. Koahu, meanwhile, realized that he was laying in the highway and exposed to Malik’s bullets. He began running toward Wallen, yelling at him to retreat to cover, when a bullet struck his leg. At the station, Burguan was taking in all the radio traffic, trying to get a sense of the scene. “Then you hear what you just absolutely don’t wanna hear. Somebody puts out, ‘We’ve got an officer down,’” the chief recalled. As officers continued the gunfight with Malik, a helicopter circling overhead began preparing to come down to extract Koahu. Stumbling into a nearby yard, Koahu pulled up his shorts up and saw the hole. “I didn’t see blood pouring out of my leg like there was going to be…a femoral hit. And I said, okay I got to keep fighting, I’m not going down like this,” he said. “Some of the folks that were on the radio had the wherewithal to say, ‘the officer’s okay, we don’t need the airship,’” the chief recalled, noting the relief he felt. Wallen was still pinned down and Koahu was bleeding and exposed, and it wasn’t clear if Malik was still alive and firing at officers. Eventually, a group of officers dared to drive a patrol car up to Koahu, to remove him from the scene. He refused to leave and joined the group in pushing closer to Wallen – who at this point had used all of his rifle and shotgun ammunition, leaving only his pistol. Wallen recalled the group getting within about 30 feet of his location. With those officers providing covering fire, Wallen made a run for the friendly vehicle. The group was able to safely pull back to a safer location, and at that point, Wallen said, SWAT teams were en route. Eventually, the gunfire subsided. Not sure if Malik was dead, or if the car was rigged to explode, police sent in a special bomb squad vehicle to pull her body out. That was when they realized the second suspect was a woman – the mother of an infant child, now in foster care. Four hours and 17 minutes after the first shots were fired both Farook and Malik were dead. Fourteen innocent people were dead or would later die from their injuries in the initial shooting. Twenty-two others were injured, and permanent scars are left in lives of hundreds more. The commanders – Burguan, McMahon and the FBI’s Bowdich – have been praised for their collaboration and ability to put aside the typical interdepartmental differences. Svonkin, the computer analyst, now teaches other law enforcement agencies how to best track down suspects using computer databases. Boden, the man who memorized the license plate, has been honored as a hero. In the end, the firefight saw the officers and perpetrators exchange some 500 rounds. The gunbattle lasted about five minutes – an eternity in law enforcement. Wallen, Capps, Schuelke and Koahu are back on the job. The worst injury sustained by law enforcement was the bullet that Koahu took. The bullet is still buried in his leg. ABC News’ Randy Kreider, Cho Park, Alex Hosenball, Lee Ferran, Tom Marcyes, Kalyn Wilson and Elizabeth Yang contributed to this report. Follow the ABC Investigative Unit on Twitter. Follow the ABC Investigative Unit on Facebook.